Vijay K. Kuchroo, Brigham and Women’s Hosp., Harvard Med. Sch. Gerald T. Nepom, Benaroya Res. Inst. Vishwa Deep Dixit, Yale Sch. of Med. Alyssa H. Hasty, Vanderbilt Univ. Mark M. Davis, HHMI, Stanford Univ. Michael S. Diamond, Washington Univ. Sch. of Med. Dmitry I. Gabrilovich, Wistar Inst. Elizabeth A. Repasky, Roswell Park Cancer Inst., Stress and immunosuppression: a matter of degree? Garnett H. Kelsoe, Duke Univ. Eugene M. Oltz, Washington Univ. Sch. of Med. The AAI Distinguished Service Award recognizes an individual for outstanding service to AAI and the immunology community. Dr. Oltz is honored for his outstanding service as member and chair of the AAI Publications Committee, 2012-2016. Jonathan C. Kagan, Harvard Med. Sch., Boston Children’s Hosp. AAI President Arlene H. Sharpe and Robert Balderas, Vice President of Biological Sciences, BD Biosciences, will introduce the awardee and present the award immediately prior to Dr. Kagan’s lecture. Michel C. Nussenzweig, HHMI, Rockefeller Univ. AAI President Arlene H. Sharpe and Gene Lay, President and CEO, BioLegend, will introduce the awardee and present the award immediately prior to Dr. Nussenzweig’s lecture. AAI President Arlene H. Sharpe and Christoph Hergersberg, Vice President, Research and Development, Thermo Fisher Scientific, will introduce the awardee and present the award immediately prior to Dr. Belkaid’s lecture. Diane J. Mathis, Harvard Med. Sch. The FASEB Excellence in Science Award recognizes a woman in biological science whose outstanding research achievements have contributed significantly to understanding a specific discipline. AAI President Arlene H. Sharpe and Joseph Sun, Mem. Sloan Kettering Cancer Ctr., will introduce the awardee and present the award prior to the start of the President’s Symposium. Jean-Laurent Casanova, HHMI, Rockefeller Univ. AAI President Arlene H. Sharpe will introduce the awardee and present the award immediately prior to Dr. Casanova’s lecture. In addition to Career Awards, AAI annually provides more than 700 AAI meeting Travel Awards and Grants to recognize the promise and bolster the professional development of investigators of all career stages. The adoptive transfer of specific lymphocyte subsets has been pursued as a strategy for immunotherapy over the past several decades, either for immune potentiation or immune suppression. Advances in genetic engineering technologies have enabled the reprogramming of lymphocytes, providing these cells with new specificities and even new functional attributes. Perhaps the most advanced of these strategies in clinical development is the application of chimeric antigen receptor (CAR)-transduced T cells for the treatment of B cell malignancies. This session will explore the diversity of approaches being investigated in lymphocyte engineering, both in the context of cancer and in other clinical scenarios. A new presidential administration can usher in a great deal of change, including new leadership in key scientific posts who will help implement the president’s agenda and fulfill the missions of their agencies. This session will explore President Donald Trump’s budget and policy priorities, as well as the priorities of the Republican-led Congress, in the area of biomedical research. What changes can we expect, and what issues are likely to dominate the debate? Join the AAI Committee on Public Affairs in welcoming experts who can share important insights and answer pivotal questions. Are you looking for new ideas or strategies to enliven and improve your teaching? If so, please join us for this special interest group which will focus on strategies that instructors can use to successfully convey immunology concepts to students at the undergraduate and graduate level. Topics will include the applications of problem-based learning, the use of digital communication and social media in modern teaching, strategies for teaching laboratory methods, and more. The session will end with structured breakout discussion groups for undergraduate and graduate/medical school teaching. Undergraduate teaching topics for discussion will include: developing a teaching philosophy; use of take-home vs. in-class tests; developing a course syllabus; and selection of effective textbooks. Breakout discussions for medical school teaching will cover optimal use of handouts and notes; spaced learning and testing effect; preparing students for the U.S. Medical Licensing Examination (USMLE); writing USMLE-style exams and assessments; question banks for test questions; and the flipped classroom in medical education. Current educators, new faculty, and trainees with an interest in teaching are welcome. Matthew Sleeman, Executive Director, Immunology & Inflammation, Regeneron Pharmaceuticals, Inc.
Table Leaders: Steve M. Varga, Univ. of Iowa; Subbarao Bondada, Univ. of Kentucky; Ashok Kumar, Children’s Hosp. of East Ontario Res. Inst. ; Arash Grakoui, Emory Univ. ; Chander Raman, Univ. of Alabama, Birmingham; Michelle A. Kutzler, Drexel Univ. Col. of Med. ; Klaus Ley, La Jolla Inst. for Allergy and Immunol. ; Tonya J. Webb, Univ. of Maryland Sch. of Med. Table Leaders: Malini Raghavan, Univ. of Michigan; Janice S. Blum, Indiana Univ. Sch. of Med. Table Leaders: Cathryn Nagler, Univ. of Chicago; Laura Santambrogio, Albert Einstein Col. of Med. Table Leaders: Virginia Shapiro, Mayo Clin. ; Mark L. Lang, Univ. of Oklahoma Hlth. Sci. Ctr. ; Robert J. Binder, Univ. of Pittsburgh; Catherine C. “Lynn” Hedrick, La Jolla Inst. for Allergy and Immunol. Table Leader: Ifor R. Williams, Emory Univ. Table Leaders: Claudia Jakubzick, Natl. Jewish Hlth. ; Luis A. Sanchez-Perez, Duke Univ. ; Tonya Webb, Univ. of Maryland; Harlan Jones, Univ. of North Texas Hlth. Sci. Ctr. Table Leaders: Mireia Guerau-de-Arellano, Ohio State Univ. ; Charlotte Vines, Univ. of Texas, El Paso; Eduardo Davila, Univ. of Maryland Greenebaum Cancer Ctr. Table Leaders: Jonathan A. Deane, GNF/Novartis; Robert Balderas, BD Biosciences; Margaret Bynoe, Cornell Univ. Col. of Vet. Med. Michael P. Cancro, Univ. of Pennsylvania Sch. of Med., How to review scientific manuscripts: the forest or the trees? Your data are good and now it’s time to write the manuscript. What steps are essential to tell the story clearly and convincingly? What is the best way to present your data? Once the manuscript is reviewed, how should you respond to the reviewer comments? What ethical pitfalls should you be aware of in order to avoid possible problems? If you would like to become a reviewer, what do you need to know about how to review a manuscript? These and other questions will be addressed in this session sponsored by the AAI Publications Committee. Radhey Kaushik, South Dakota State Univ. This symposium will feature approaches for cancer immunotherapy relevant to both human and veterinary health, with an emphasis on immune system recognition and activation. Various active and passive immunotherapy approaches will be presented, highlighting the ability of antibodies and immune cells to destroy tumor cells while sparing healthy cells. The symposium will highlight recent advances in comparative tumor immunology that demonstrate translational cohesion and support the current “One Health” approach to identify scientific commonalities and medical treatments that benefit both humans and animals. Sonia Sharma, La Jolla Inst. for Allergy and Immunol. Mary H. Foster, Duke Univ. Catherine M. Bollard, Children’s Natl. Med. Ctr., George Washington Univ. Kenneth D. Beaman, Chicago Med. Sch., Rosalind Franklin Univ. of Med. and Sci. David M. Rothstein, Univ. of Pittsburgh Med. Ctr. Yang-Xin Fu, Univ. of Texas Southwestern Med. Ctr. Berhane Ghebrehiwet, Stony Brook Univ. Hlth. Sci. Ctr. Paul K. Wallace, Roswell Park Cancer Inst. Cheong-Hee Chang, Univ. of Michigan Sch. of Med. Brian A. Cobb, Case Western Reserve Univ. Sch. of Med. Michael B. Atkins, Georgetown Lombardi Comprehensive Cancer Ctr. Mario Sznol, Yale Sch. of Med. Adrian C. Hayday, King’s Col. London, U.K.
For anyone seeking a job outside of academia, how you present yourself on paper is critical. A well prepared resumé can make all the difference in securing that interview. The focus of this session will be on the important elements of a resumé, the differences between a resumé and the standard academic curriculum vitae, and the information needed to make a good impression. In this special career development session, attendees will be instructed in how to transform their CVs into professional resumés. Small breakout sessions for individual consulting will follow from 10:30 AM to 12:30 PM in Room 302. Bring your CV! Are you looking for new ideas or strategies to enliven and improve your teaching? If so, please join us for this special interest group which will focus on strategies that instructors can use to successfully convey immunology concepts to students at the undergraduate and graduate level. Topics will include the applications of problem based learning, the use of digital communication and social media in modern teaching, strategies for teaching laboratory methods, and more. The session will end with structured breakout discussion groups for undergraduate and graduate/medical school teaching. Undergraduate teaching topics for discussion will include: developing a teaching philosophy; use of take-home vs. in-class tests; developing a course syllabus; and selection of effective textbooks. Breakout discussions for medical school teaching will cover optimal use of handouts and notes; spaced learning and testing effect; preparing students for the U.S. Medical Licensing Examination (USMLE); writing USMLE-style exams and assessments; question banks for test questions; and the flipped classroom in medical education. Current educators, new faculty, and trainees with an interest in teaching are welcome. This session will focus on tips and techniques to help you successfully navigate the interview process. Emphasis will be on how you can present yourself in the best possible light. You will also learn how to respond to unexpected questions. This session is open to anyone but is especially intended for student and postdoctoral attendees. AAI reports on the “state of the association” to its members at every AAI annual meeting. Members will hear from the Executive Director, the Secretary-Treasurer, the Editors-in-Chief of AAI journals (The Journal of Immunology and ImmunoHorizons), and the Chair of the Committee on Public Affairs on the financial standing of AAI and other matters of importance to the membership. Selected 2017 AAI awards will also be presented during this session. Eugene M. Oltz, Ph.D., Washington Univ. Sch. of Med. Erica L. Stone, Ph.D., Assistant Professor, Wistar Inst. Oscar A. Aguilar, Graduate Student, Univ. of Toronto, Sunnybrook Research Inst. Semir Beyaz, Graduate Student, Harvard Med. Sch. Rajendra Karki, Ph.D., Postdoctoral Fellow, St. Jude Children’s Res. Hosp. Kelsey Voss, Graduate Student, Uniformed Serv. Univ. of the Hlth. Sci. 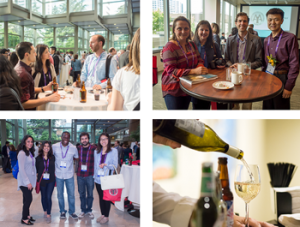 All abstracts – including those selected for Block Symposia – will be scheduled for poster presentation in Poster Sessions. This is perhaps the most dynamic aspect of the AAI annual meetings. 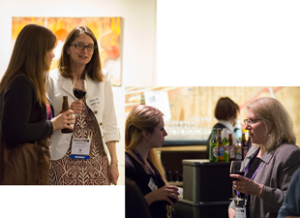 Take part in face-to-face discussions with abstract authors and learn about their most recent, unpublished research. Poster Sessions will be held daily (unopposed by any other session) in the Exhibit Hall from 2:30 PM – 3:45 PM. 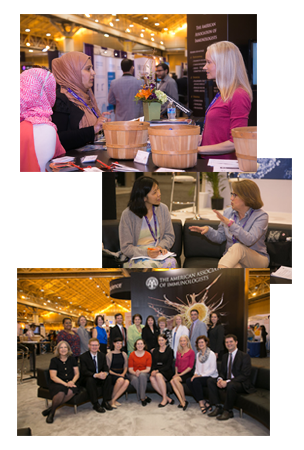 Almost 2,000 authors will be present at IMMUNOLOGY 2017™ to discuss their most recent work, network with colleagues, and find the latest developments in their field. 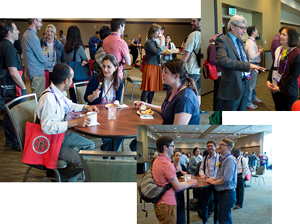 AAI welcomes new Regular, Associate, and Postdoctoral Fellow members to meet each other at a relaxed gathering. Members of the AAI Membership Committee, AAI President Arlene Sharpe, and fellow Council members will join new members for casual conversation and light refreshments. Following the President’s Address, exit the Ballroom for the Opening Night Welcome Reception. Connect with friends, make new acquaintances, plan your week, and enjoy the beautiful view of D.C. Remember to bring the complimentary drink ticket included with your meeting badge. Registered attendees only. AAI welcomes the 2017-18 AAI Public Policy Fellows to this first meeting with members of the AAI Committee on Public Affairs and the AAI Public Affairs staff. Discussion topics will cover the upcoming program year, including the Fellows’ 2018 Capitol Hill visit to advocate for increased support for biomedical research and the National Institutes of Health. AAI honors the dedicated member volunteers of the association—committee members, editors, abstract programming chairs, and others—who work on the membership’s behalf throughout the year by giving generously of their time in support of the AAI mission. Open (by invitation only) to 2016-2018 AAI volunteers. Celebrate the freedom of science in style at the Newseum, the world-famous museum of news and journalism, the home of the First Amendment in Washington, D.C. You’re invited to enjoy appetizers from Wolfgang Puck, drink, and dance the night away amidst front pages from 80 international newspapers, the powerful Pulitzer Prize Photographs Gallery, and interactive displays that tackle real-life reporting dilemmas. 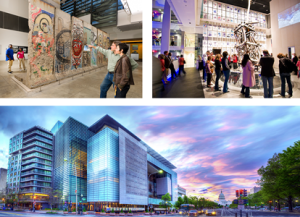 Take in entire sections of the Berlin Wall and explore where rock and roll and politics meet at the Newseum’s newest exhibit, “Louder than Words.” Before you leave, visit its balconies for breathtaking views of the White House and the U.S. Capitol building. The news has never been more exciting! Open to all IMMUNOLOGY 2017™ attendees. Come as you are. Complimentary shuttle service will be provided throughout the event between the Newseum and the Walter E. Washington Convention Center. Attendees must be at least 21 years of age. Meeting badge required.